This photo was taken in January of 1948. 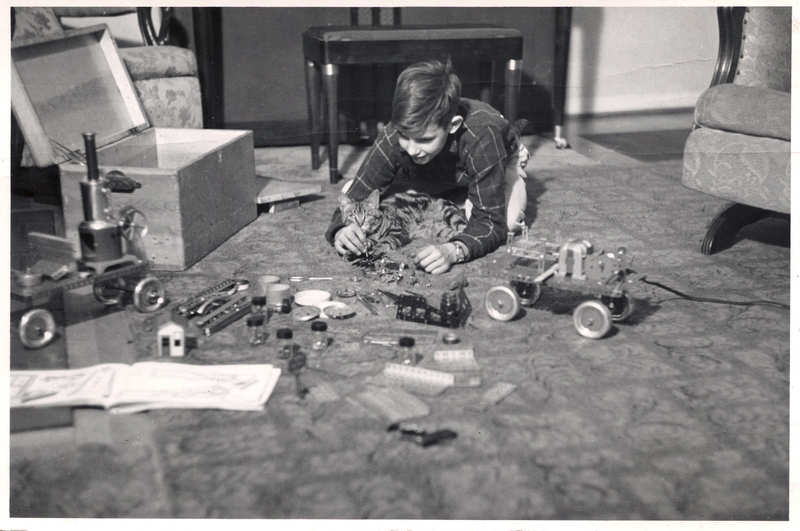 The boy is my grand uncle Frank who seems very content playing with his erector sets. I love the details of the room – the pretty rug, the piano, the two chairs, and the seemingly home made wooden chest beside my Uncle Frank. What a great photo! He looks so happy! Although the cat looks a little disinterested! Love it! Thank you. I love this photo. I agree that cat does look disinterested – but don’t they usually? Love your posted photos. Don’t stop sharing ’em! Appears your ancestors were animal lovers. This could have been a picture of me….well, not 1948! 1958 maybe!! Thinking back to some of the toys we took for granted as children are now “collector’s items”! I still have a double barreled shotgun from my youth. It’s only about 18″ long and it only shoots corks. Now that I think of it, I only shot them at my older sister until i got caught! I’m chuckling right now. It sounds like you were a perfectly normal boy. I have three boys myself and shooting corks at each other would be their preference over shooting corks at a target.